- Added "Number of Media Types" to selectable criteria. Can be used to detect Combo boxes. The lock feature is something I had use for myself. Not sure how useful it will be to others. But what it does is that it locks a selection criteria so that it is not removed when you click "Clear criteria". To use it, right click on a criteria and check "Locked". You can still remove it without unlocking it by clicking the Remove button (the minus button to the left). When locked, the criteria changes color to a light pink. As for "Number of Media Types", a value greater than one should indicate a combo box. If you wish to use "Number of Media Types" in PQPal you need to update it first. You can wait for mediadogg to release an updated setup for it, or you can do it manually using the files in PqLib_120.zip. - You must exit DVD Profiler before you copy the files, or they will be in use. - You must run Explorer as administrator, since the Program Files folder is protected by Windows. I was playing around with Statistics in ProfilerQuery and I discovered a couple of bugs, at the same time that I realized I had forgotten to document an important feature in Statistics in the Help file. I'm sure I mentioned that feature somewhere in this thread, but it's quite some time ago, so I guess it may be useful to remind you of it. 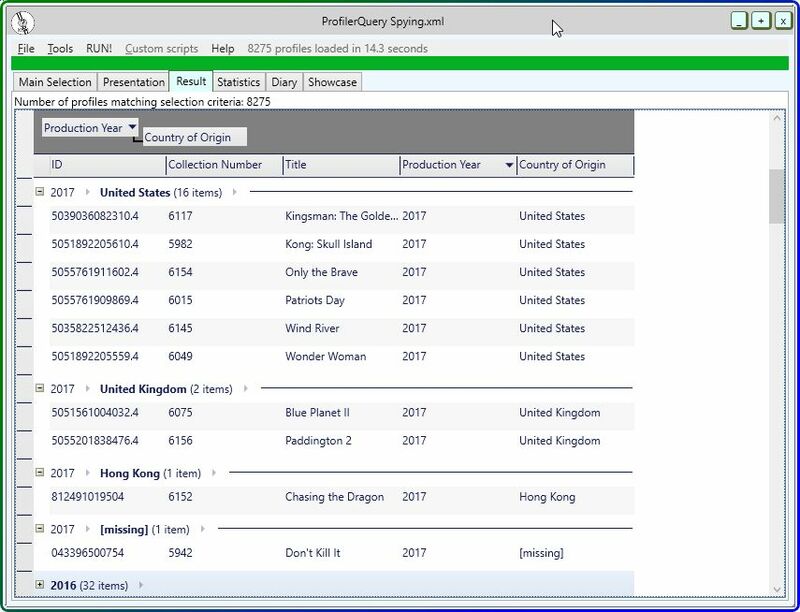 Double clicking an entry in Statistics will rerun the query with that criteria added. There's more to it, so please read about it in the updated help file. I put a lot of effort into making my help files easy to read. Even if you are familiar with ProfilerQuery you may find things that you didn't know. - Statistics for Boxsets showed everything as "children" rather than "parents" and "children". - Double clicking an entry under Audio Format resultet in no profiles found. So now you can download ProflerrQuery 3.21.1. Last Edited and Profile Timestamp. Last Edited is fairly self evident. If you haven't edited the profile yourself, this is the time you added the profile to your collection. Profile Timestamp is - as far as I have been able to determine - the time when the current profile was released from Invelos. If the profile is not downloaded from Invelos, the timestamp will show Dec 30 1899. As with all datetime fields, the format is dependent on your Windows settings. I just added the same copy title functionality as in ProfilerMissing when a title is double-clicked.. Original = Original Title - if available - will be copied to the clipboard, otherwise the ordinary Title. 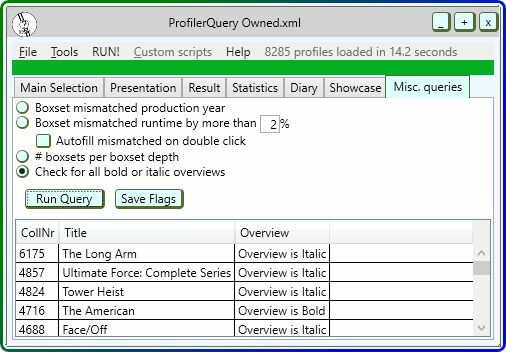 Would you like ProfilerQuery to look like this? The reason I am asking is that I have experimented with replacing the standard datagrid in WPF with the datagrid in WPF Extended Toolkit. The current datagrid looks better, in my opinion, but the Toolkit datagrid allows grouping (as shown above). But it comes at a cost. The size of the current ProfilerQuery is about 2 GB. With the toolkit the size would be about 145 GB. But these days everyone has plenty of disc space, right? Or maybe not? So, any views? Is grouping interesting? Yay or Nay? But it comes at a cost. The size of the current ProfilerQuery is about 2 GB. With the toolkit the size would be about 145 GB. I like it. It does look good and readibility of the results is greatly improved. But you meant MB, not GB, right? Given the lack of interest I will keep the current datagrid. No sense in putting in a lot of development work into something that (almost) nobody seems to want. This update contains a new tab with two useful queries and a totally unnecessary one. The first two I implemented because I tried to use the same queries in Database Query and I found them not working correctly. So instead of waiting for Mark to fix them, I decided to implement them myself. I do hope that Mark doesn't feel like I stepped on his toes. The two important ones are a check that the production year in boxset parents actually match the earliest of the child profiles, and a check that the runtime for boxset parents match the sum of the runtime for the child profiles. The updated help file documents these queries in detail. I should also mention that I made a small mistake with release 3.24. The zip file mistakenly included the dlls for the Extended WPF Toolkit. They cause no problems, but they take up unneccesary disk space. If you see dlls with names starting with xceed you can safely delete them from your ProfilerQuery directory. When I was working with my new queries I realized that although getting the information was useful, it would be even more practical if I could let ProfilerQuery change the supposedly incorrect fields. So if you check the Autofill checkbox, that's what will happen when you double click a row. Note "supposedly"! You should be aware that it may be the child data that is incorrect. Maybe not very likely, but still. Use with care! I also realized that the computed sum of the production years for boxset children would be misleading if some, but not all, runtimes were zero. So now it will show 0 if all children are missing runtime, and -1 if only some of them do. And of course, double clicking a row won't use the child values that are 0 or -1. And while I was at it I also fixed a birthyear display bug. Very minor update. The only difference is that the help function is now context aware, so hitting F1 will take you to the appropriate chapter in the help file. Since there are no actual bug fixes or enhancements, I have not activated the new version flag for this release. If you have already downloaded 3.26.0 there is no real reasosn the update, unless you want to try the new help feature. If the entire overview is bolded or italicized, omit this formatting. - Self! Do you think you have any profiles that violate this rule? I scratched my head carefully (avoiding getting splinters under my fingernails). - I don't know! How can I find out without perusing all my 8000+ profiles? Well, the answer was kind of obvious. Write a program. So I wrote a short test program to see if I indeed had any profiles that had all bold or all italic overviews. And I found 16. That's 1 in 500. I don't know how representative my collection is, but I figured there probably is quite a few profiles out there that suffers from this. - Do you think you should incorporate this in ProfilerQuery? Under Misc. Queries, perhaps? I'm thinking "It's done! I'm free!" and then that little voice in the back of my mind goes "What if ..." and I'm trapped.